Field surveys sometimes involve witchcraft, rice wine, and laughter, as the team from MK10 discovered on their recent trip to a Brao village in Attapeu province, Laos. On the very first day of 2013, after celebrating the New Year at our temporary field office in Attapeu, 16 researchers and the team leader headed to Somboun village. We planned to stay in the village to finish our survey of 84 households. Somboun village is a Brao ethnic minority village, located in Phouvong District, about 60 km away from Attapeu provincial municipality. The village is located on the other side of Xe Su (Su River), with the only access to the village during the rainy season being by raft across the river. I felt a burst of excitement after our encounter with ‘Lung’ or uncle Khamphouang, a village member and a former head of Somboun Sub-district who told us that we needed to attend a traditional ritual to welcome us before we could stay in the village. He said that the ceremony is to notify the villagers of our presence and intended work. With his voice lowered, he whispered to us that this is also to prevent the villagers’ ‘witchcraft’, an age-long ethnic belief. 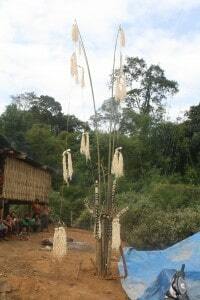 For the Brao, witchcraft, usually called ‘Khong’ or ‘Warn’, is believed to be used to protect them from any threat, to heal other people, and also to harm their enemy. Right after we arrived, Lung Khamphouang brought two steamed chickens into the house, and a jar of ‘Lao Hai’ or homemade rice wine. The village’s holy man, village headmen, the heads of village organizations, and some senior villagers were presented at this welcoming ceremony. We took about an hour to introduce ourselves and talk about the village’s overall situation. A moment later, Lung Khamphouang and the holy man silenced the crowd when they said the words: “it’s time.” The team and the rest of the villagers waited enthusiastically for the most important part of the ceremony to come. The holy man was the first to start talking, and it was all in Brao, the local language spoken in the village. 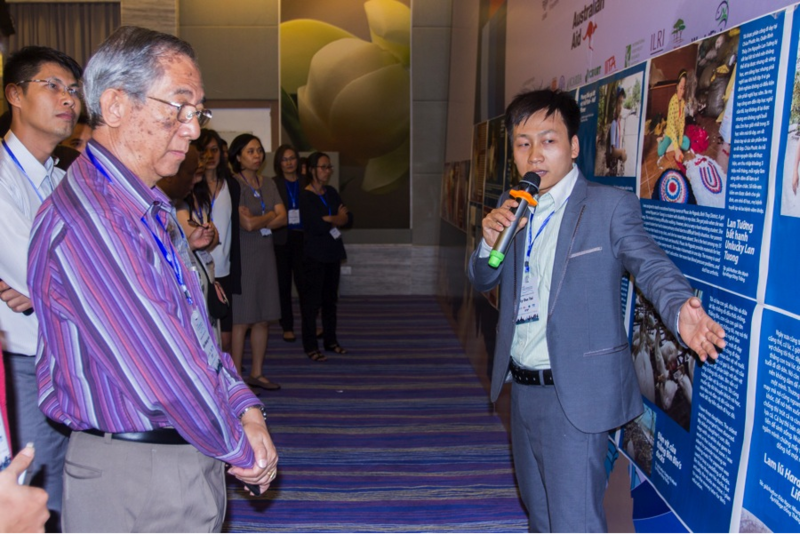 The team exchanged nervous glances, recalling Lung Khamphouang’s words on village witchcraft. It took a little while before the village headman noticed our discomfort and explained to us that the holy man was giving us his welcoming speech and blessing our work. The rest of the villagers then took turns coming up and welcoming us. After that, we were invited to drink Lao Hai. 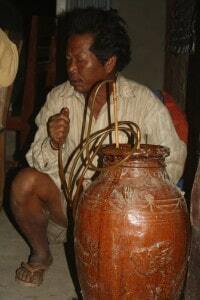 One researcher and one villager were paired up and took turns drinking Lao Hai. The ceremony ended, and we were now welcome to stay in the village. On the second day, the researchers paired up and started visiting houses to do the survey. A young local man was assigned by the village headman to accompany and guide us to the houses. We were warned not to go to houses without his guidance since some households were performing a sacred ritual called ‘PhaKhuay’, an annual Brao tradition, where a ‘Khuay’, or a buffalo, and other animals are sacrificed in return for protection of the household and members’ health. During this time no outsiders are allowed to enter their houses. The villagers seemed to be worried at first, but then they became more relaxed and started to talk more. We were surprised to see how warmly the villagers welcomed us. During the household surveys, several neighbors would come and gather in the house being surveyed, and try to share their ideas with us. They also talked, discussed, and laughed together in their own language. 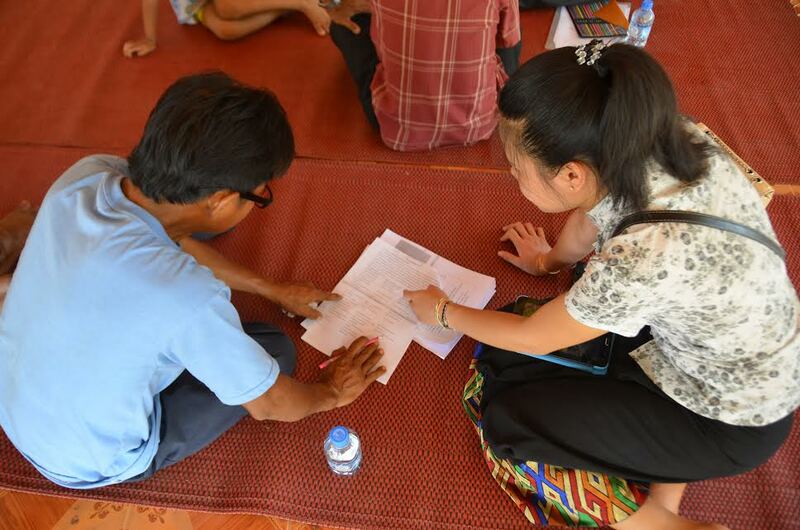 Quite often, we were also invited to visit their houses to do the survey, and many times we could not help but tell them that we could only do two surveys per day, and that we would come to their house on the next day. Much of the time we found it was very hard to communicate and ask the survey questions. Problems arose particularly when interviewing women who only spoke Brao. Because we did the survey during the day, when men are usually out in the forest hunting for wild animals, we often had to spend more than an hour—sometimes two—to complete our 40-page questionnaire. Quoted above is one woman’s answer when I asked about cultural aspects of the village and her household–if she has changed her dressing style over the last ten years. I was stunned by the answer for several seconds before I realized that I was making a big mistake by using academic language. My inability to adapt to the local perceptions had led her to misinterpret the question: she thought that we were asking if she had changed her clothes over the last ten years, rather than changed the style. By using simpler terms on my second try, I was able to get a better answer. Every night after surveying, the team would come together and discuss the problems we had encountered during the day. We found that each team member had encountered similar problems due to miscommunication and the language barrier. The questionnaire was consistently revised; we would add, change, or explain some words to improve the questionnaire. Some researchers even put short Brao translations into the questions. During the survey in the village I had encountered many new and different things, some were even strange to me. Despite the differences and language barrier, the villagers’ warm welcoming shows that we are all the same and that we can live like a family. One thing I could feel wholeheartedly is the richness in the Brao cultural heritage, the way they live in harmony with nature, and the effort they had made in preserving what they believe. Brao people may speak a different language which had hindered their expression of their interest, needs, and identity. But that doesn’t mean that they are different. So now it’s time to understand each other.